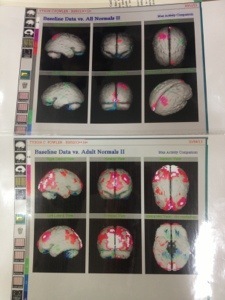 Here is a picture I took of Tyson’s most recent brain scan and below is the scan from April for comparison. At first glance, I was worried that the lack of whites, reds, and pinks was an indication of decline, but Dr. Shroff explained that it just means that at the time of the test, Tyson was extremely relaxed, which he admits that he was (having just arrived to India the day prior, he was very tired and calm). In fact, if you look closely, you can see there is continued improvement. The areas that were greens and blues are slowly becoming grey and the black spots are fading away. Also, before we came back to India, Dr. Shroff ordered a CD-57 test. This test is yet another way to measure or track progress in Chronic Lyme patients. In essence, the Lyme bacteria suppresses the immune system and when the CD-57 scores very low, it’s an indication that the Lyme bacteria is very active in the system. Doctors like to have their Lyme patients score at least 60; 200 or greater is the average for a healthy patient. Tyson scored a 90 which shows that his immune system is getting stronger! Remember that I mentioned before that the stem cells work to strengthen the patient’s immune system? This is just one more piece of evidence that it’s working. Tyson has been receiving so many stem cells this trip! It’s very exciting because they begin to work right away. Many of the doses are given through IM (intramuscular), an IV through his port in his chest, and also locally to various parts of his body. For instance, he has shots in his calves, thighs, behind the knee, his armpits, the back of his neck and on both sides of his hands. Not all at the same time or even in the same day, but usually a small combination of a few of them. They also do procedures once every 2 wks (typically) where he has either a shot in his spine or an Epidural catheter. The latter of the two stays in for 2-4 days and Tyson receives “top-offs” 3 times a day. What this means is that they administer the stem cells through the catheter at the highest dosage and with the most frequency. It’s a very painful procedure for Tyson (haven’t heard too many complaints from the other patients…Tyson’s just very sensitive because of his physical condition). Tyson had this catheter procedure this week for 2 days. He’s been slowly but steadily improving in PT, increasing his distance each day, kicking a little higher and strengthening his core. He and Dipin also came up with a great idea yesterday to try to modify the standing bike for Tyson to use. Dipin removed the seat on the bike so that Tyson could roll up to it, park his wheelchair and pedal. It worked great and I think they’ll begin to incorporate it into his workouts. Tyson loves it because he says it makes him feel “normal” again. God- I’ll take those moments any way we can get them! It’s Saturday afternoon now. We finished PT and OT and we had our lunch. It’s pouring outside. Pretty incredible to experience an Indian monsoon season… I was able to find the British Open on the tv and that’s made Tyson a very happy man. We will likely be watching that the rest of the day and if it ever stops raining, we’ll go sit outside. That’s about all for now. Thanks for checking in and for keeping us in your thoughts and prayers.